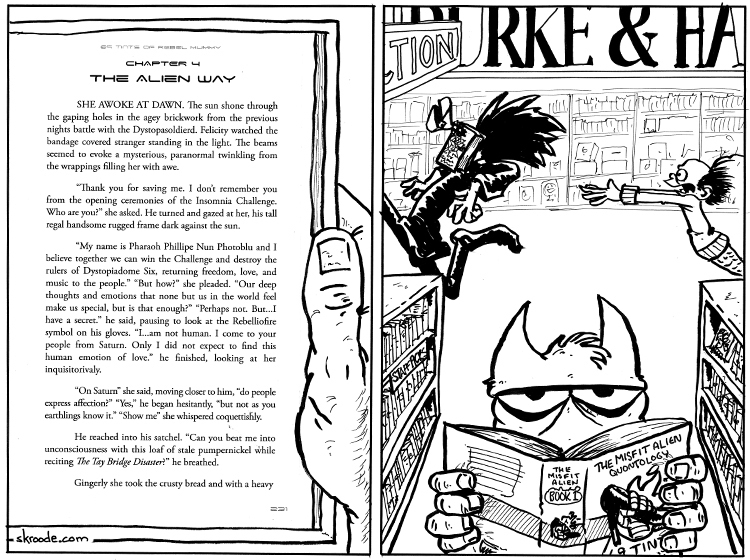 "69 Tints of Rebel Mummy Chapter 4: The Alien Way"
Writing badly is fun. Pretty much that’s it in a nutshell. Also again, a comic that started as a simple concept spiraled out of control. Which is good. Sometimes. So you don’t get the eye strain and because I care, here’s the page. SHE AWOKE AT DAWN. The sun shone through the gaping holes in the agey brickwork from the previous nights battle with the Dystopasoldierd. Felicity watched the bandage covered stranger standing in the light. The beams seemed to evoke a mysterious, paranormal twinkling from the wrappings filling her with awe. “Thank you for saving me. I don’t remember you from the opening ceremonies of the Insomnia Challenge. Who are you?” she asked. He turned and gazed at her, his tall regal handsome rugged frame dark against the sun. “My name is Pharaoh Phillipe Nun Photoblu and I believe together we can win the Challenge and destroy the rulers of Dystopiadome Six, returning freedom, love, and music to the people.” “But how?” she pleaded. “Our deep thoughts and emotions that none but us in the world feel make us special, but is that enough?” “Perhaps not. But…I have a secret.” he said, pausing to look at the Rebelliofire symbol on his gloves. “I…am not human. I come to your people from Saturn. Only I did not expect to find this human emotion of love.” he finished, looking at her inquisitorivaly. “On Saturn” she said, moving closer to him, “do people express affection?” “Yes,” he began hesitantly, “but not as you earthlings know it.” “Show me” she whispered coquettishly. He reached into his satchel. “Can you beat me into unconsciousness with this loaf of stale pumpernickel while reciting The Tay Bridge Disaster?” he breathed.